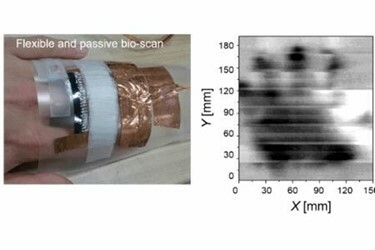 Scientists at Tokyo Institute of Technology have developed a portable and wearable terahertz scanning device made using arrays of carbon nanotubes, for applications including non-invasive inspection of equipment such as syringes, and imaging of cancer cells, blood clots, and teeth. The findings are published in Nature Photonics, November 2016. Imaging devices based on terahertz waves show promise for noninvasive inspection of solid objects and soft tissue of the human body. However, terahertz waves have difficulty in imaging and reproducing the curved contours of three-dimensional objects. Furthermore, terahertz devices currently used for whole body scans at airports must rotate 360 degrees around the human body, and thus they are large, bulky, and not portable. In addition, the materials used to fabricate conventional terahertz systems are not flexible, and the terahertz detectors, must be cooled in order to achieve high detection sensitivity. Therefore, researchers are constantly searching for ways of producing terahertz imaging system that are portable, flexible, and operates efficiently at room temperature. To address these challenges, Yukio Kawano and colleagues at the Laboratory for Future Interdisciplinary Research of Science and Technology, Tokyo Institute of Technology, have demonstrated a terahertz imaging device fabricated with arrays of carbon nanotubes (CNT). Notably, CNTs have previously been used for the fabrication of photodetectors that operate in the visible, infrared, and terahertz regions of the electromagnetic spectrum. In the future, the research team expects that the applications of their terahertz scanner will enhance the capability of noninvasive inspections in pharmaceutics, food quality control, and medical monitoring. These applications are possible because the terahertz scanner is wearable, portable, and can scan 3D objects without requiring complex optics or equipment.